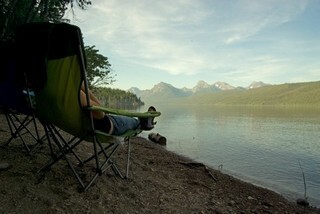 Of all Glacier National Park hotels, Lake McDonald Lodge has the best family accommodations. You can be excused for thinking you are in Switzerland rather than Montana when you first set eyes on this immaculate Glacier National Park lodge. Built in 1914, it is in an idyllic setting on the beautiful shores of Glacier National Park’s Lake McDonald. The lodge was listed on the National Register of Historic Places in 1987. The 3.5 floor high Swiss Chalet is surely one of the most beautiful of all the Glacier National Park hotels and I have to confess is my personal favorite. On the floor of the large, open lobby you will see carved messages from long-forgotten Blackfeet, Chippewa and Cree native Indians. Look around and admire the many hunting trophies and the cave art pictographs said to have been drawn by artist Charlie Russell. Located in the southwest of Glacier National Park at an elevation of 3,170 feet (966m), a stay on Lake McDonald’s shores will be memorable. There are few more pleasant places to sit and enjoy a drink than from the hotel verandah overlooking the glacial waters of Glacier National Park’s Lake McDonald. 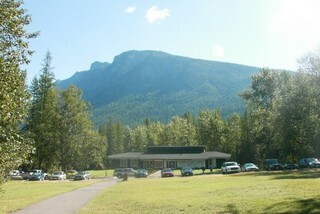 Of all Glacier National Park hotels, this lodge is open the longest (from late May through September). The 100 guest rooms and cabins offer comfortable accommodations, along with excellent amenities such as trout fishing, swimming in the lake and boat trips aboard the historic ‘DeSmet’. The camp store, ATM cash machine, gift shop, Jammer Joe’s Grill and Pizzeria, Lounge Bar and Fireside Dining room cater to both the lodges guests and campers and hikers in the area. Bus tours and Ranger Programs means that there is always plenty to see, learn and do if you’re a guest of this Glacier National Park hotel. Discover hiking trails in the Lake McDonald Lodge area. This Glacier National Park lodge is a one-of-a-kind hotel. Hotel rooms are offered in the main lodge, along with Motor Inn rooms in the two-story motel building nearby. You can stay in original, duplex cabins, each with its own small porch. These rooms are super nice as they have views of Lake McDonald and are surrounded by trees and nature paths. All rooms are comfortably furnished and have private bathrooms, double or twin beds and parking nearby. An alarm clock, telephone, fan and hairdryer are provided, along with an iron and ironing board. Down-alternative pillows, mattress toppers and all that fresh air and exercise from hiking in Glacier National Park ensures a good night’s sleep. In keeping with the rustic feel of Glacier National Park lodges, guests do not have access to internet, television, air conditioning, or a refrigerator. All of this shouldn’t matter though–you’re here to hike and play, not be entertained by a box, right? Like other Glacier National Park hotels, this lodge is eco-friendly with efficient lighting, environmentally friendly toilet paper, and other efforts to reduce waste. Breakfast, lunch and dinner can be enjoyed in the hunting lodge decor of Russell’s Fireside Dining Room and I can personally recommend the wild game dishes and micro-brewed beer! Lucky’s Lounge has unrivalled views of Lake McDonald Lake or try lighter fare at Jammer Joe’s Grill and Pizzeria. You certainly won’t go hungry here! ADA accessible rooms are available on the first floor with wheel-chair access. 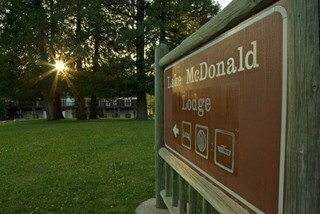 Have you stayed at Lake McDonald Lodge? 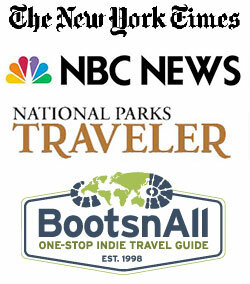 Share your review of one of Glacier National Park’s best family hotels.